With this weekend's box office estimates still to come, it looks like The Giver will at least make back its budget. According to Box Office Mojo, the film has earned about $43 million domestically, and by their standards, would need to make about $23 million to at least break even. A studio roughly earns about 55% of a film's gross as profit, and with a production budget listed at $25 million, I think it's safe to say it's a wash. Add in the foreign returns and it pushes the total to about $57 million. I'm not sure if the 55% rule applies as closely when looking at both domestic and foreign receipts combined, but I think the likelihood is that The Giver didn't end up losing money for The Weinstein Company. This isn't to say that the film was a financial success. Any studio wants its films to be blockbusters, and there was likely some hope that this movie could do quite well in cinemas. Considering that it's been in theaters for six weeks, I imagine this will be looked back on by Harvey as a disappointment. Hoping Into the Woods fairs better. I expect a full trailer within the next month! Streep going supporting for "Into the Woods"? Last year there were rumors from Gold Derby's Tom O'Nneil that Meryl may be pushed supporting for August: Osage County. We know how that turned out, as we know how it turns out every time Meryl seems to be on the bubble for category placement. One could argue that Streep could have been campaigned in supporting for One True Thing, The Devil Wears Prada, Julie & Julia and August. All of those roles earned her Academy Award nominations in the lead category, where her arguably lead younger female co-stars were either relegated to supporting (Julia Roberts), or not recognized at all. Now there are reasons to suspect that Disney may be toying with the possibility of placing Meryl in the supporting category for her role as the Witch in Into the Woods. This weekend, Cleyton Davis of Awards Circuit updated his Oscar predictions, now placing Meryl in second place in the supporting cagtegory, where he had previously had her in lead (still top five I think but not nearly as high). He also switched Emily Blunt from supporting to lead. Does he know some inside information? Also, Deadline's Pete Hammond indicated today that he feels Streep is a strong contender is supporting. The only Gold Derbery "experts" to include Meryl in any of their predictions also do so supporting. Again, this role could probably go either way, but the role of the the Baker's Wife, played by Emily Blunt, won the Tony for Lead Actress. Historically the Witch is considered one of the main characters, as she has the most solo songs and is sort of a the prestige role in the musical. Disney has already been quite obvious about giving Meryl top billing status in both the teaser trailer and first poster. This may suggest, like so many times before, that Meryl will be their main horse in regard to awards recognition. So what do we think? I happen to think it's a luxury to be in the position of being able to choose which category to campaign in, as it increases the chances for a nomination. My guess is that Meryl is in the range of 4th-6th place in the lead category. In supporting, I'd push that to 2nd-3rd. If you're that high up in supporting, and there is no super strong frontrunner (Patricia Arquette looks very solid right now, but possibly peaking early? ), anyone can challenge for the win. Do I think Streep will win a supporting and overall fourth Oscar for Into the Woods? No. Have crazier things happened? Most definitely. 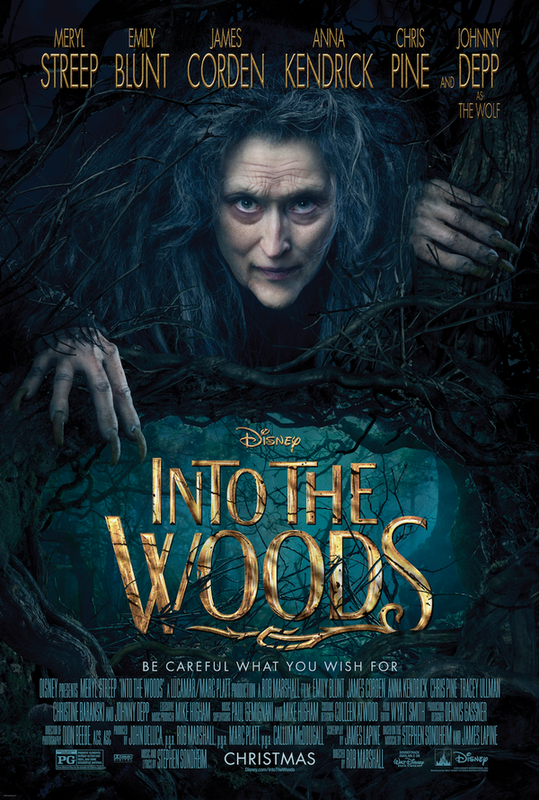 New poster for "Into the Woods"
Of course Meryl gets top billing and is the only face featured in the poster. I think this helps answer the question of whether or not she'll be campaigned in lead or supporting. Regardless...love the poster. Meryl has lent her voice to the PBS film The Roosevelts, providing the narrations for former first lady Eleanor Roosevelt. The seven part series, the first of which airs tonight, chronicles the lives of Theodore, Franklin and Eleanor. Paul Giamatti voices Teddy. I normally don't report much (or at all) on Meryl's voicework, but as a bit of a history buff, I might actually check this out once it becomes available online. Apparently is going to be available in its entirety tomorrow online. New trailer for "The Homesman"
I like this extended trailer better than the international ones. Better views of the beautiful cinematography and a better sense of what to expect from the story, without revealing the big spoiler of course. The film was shown last month in Telluride and will again be screened at the Toronto International Film Festival on the 16th. Swank is certainly in the conversation for awards consideration. The nationwide release is scheduled for November 7. Audra McDonald joining "Ricki and the Flash"? Meryl attended the premiere of her Ricki and the Flash co-star's (Kevin Kline) new film My Old Lady. Not looking too shabs in a cute print dress. More importantly, someone on the Meryl Streep forum posted a quote this morning from Kline, who essentially stated that filming was starting soon on Ricki. Telling a brief synopsis of the story, he mentioned that in the film his character, Meryl's ex-husband, is remarried to Audra McDonald. I have not heard any reports that McDonald is attached to this project, but that would seem strange for him to mention it if it weren't a done deal at this point, as filming is set for early October. I would love to see McDonald in a Meryl movie! She is a six-time Tony Award winner, her first coming in the mid 90's for her featured performance in none other than Master Class. I've been wondering for quite some time what the hell was going on with Suffragette. By most accounts, signs were pointing to a late 2014 release in the U.S. Filming wrapped this spring with little expectation of a prolonged post-production process. IMDb continues to list the film as being released in the U.S. in 2014, with specific release dates for Australia on 12/26 and the U.K. on 1/16/15. The U.K. date has been particularly telling for me up to this point. If the film were indeed released on that date, it would be highly likely that a late December release would happen in order to position the film for awards consideration in the U.S. However, this weekend I was directed to a website that now lists the U.K. release date for the film as 9/11/15. If correct, I imagine a U.S. release would accompany that date fairly closely The site also indicates that Twentieth Century Fox is the distributor of the film (Pathé in U.K.), which was news to me. Considering it's already September and there's really no official news on a distributor, no official release date in the U.S., no trailer...I don't think we'll see it this calendar year. I'm a bit disappointed because I sort of wanted this year to be a better version of her 2007, where Meryl had four films released (technically Dark Matter didn't have a non-festival release until 2008, but it was kind of special circumstance). With the barren state of the Best Actress category at this point, it seemed a good chance for Carey Mulligan as well. I suppose it's still possible that it'll happen in 2014, and if it does, I'll do a post comparing and contrasting this year with 2007. In fact I may do that anyway and eventually add a new segment to my reimagined history, placing Suffragette in 2014.